When I got back home I roused Persephone to take a look at the eclipse out her bathroom window. I’d explained the concept earlier, but now she was understandably groggy. I’m not sure she even really remembered the next morning. Fortunately she went back to sleep easily. I was not so lucky. After lying in bed for a while, I got back up to eat a bowl of cereal and read and check out the moon again. 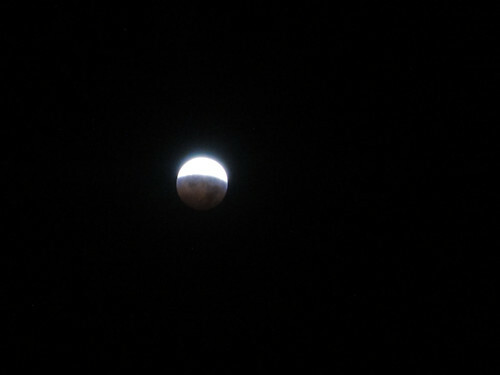 From a visual standpoint, I found the partial eclipse much more interesting than the total. The total eclipse was just a funky-looking moon, but watching the shadow of the earth sliding across the surface of the moon? That’s drama. Fully expecting to be the only person in my building braving 22-degree temperatures at 2:15 a.m. EST, I was happy to find a small crowd clustered outside the lobby, passing around a pair of binoculars. Would love to see a total solar eclipse.